Choosing your best pricing options for consistently increasing profits while delighting guests can be a real headache for most hoteliers. This is why, in a recent webinar, we joined forces with RateGain’s Alejandro Gomez, SVP of Sales and Biz Dev for Europe and Latin America, and Ullrich Kastner, CEO & Founder of myhotelshop, to map out what you need to know to develop a truly successful pricing strategy. From distribution to forecasting, digital connections to philosophy, we shared the latest best practices and techniques to improve your revenue every day. The following are some highlights of our conversation. I got things rolling by outlining some key elements that can help you start off on the right foot. First, define and understand your target markets by monitoring your demand via persona or guest profile type. Next, check competitor hotels’ pricing and offers. Don’t forget to work with OTAs and metasearch channels to gain global reach. And of course, offer your potential guests reasons to book direct. Then, monitor and optimize your performance on a regular basis. Remember, the ultimate goal is to create the right offers at the right time for the right guest through the right channel. One big issue in achieving great distribution, though, is maintaining price integrity. Did you know that, according to a recent Sojern report, travelers visit, on average, 140 sites over a 45-day path to purchase? Stats like these are one reason why you need to keep rate parity with OTAs while promoting your hotel on metasearch websites. You can do this by offering the best price value on your website while increasing direct booking by using the rate comparison widgets on your website/IBE for added transparency. Ullrich took over to talk about some of the major issues facing hoteliers in the digital world. 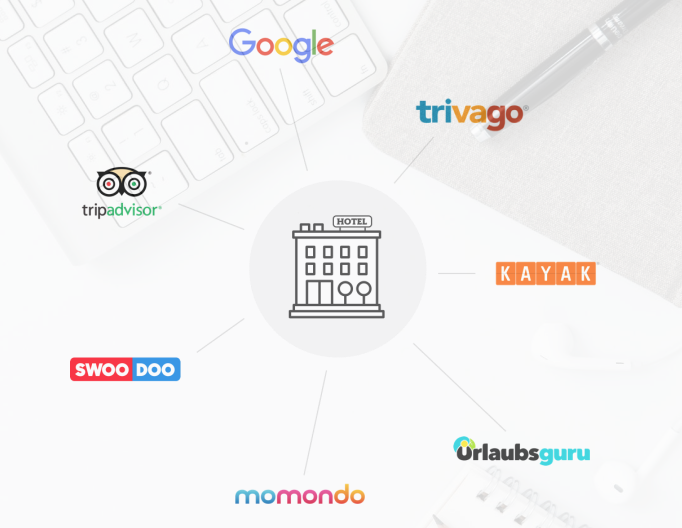 These include increasing the online visibility of your hotel, while keeping an eye on your efforts to keep pace with technological developments. For instance, you probably spend a lot of time controlling your online marketing campaigns. So, build up your experience with the mechanics of meta-search-engines and other online platforms by putting more emphasis on targeted distribution of your online budget, and by also engaging in performance measurements more often. We could all use a helping hand when it comes to the often-confusing metasearch, for instance, so having a tech partner (or partners!) that can advise you on your placements on meta-searches, including quarterly strategy discussions concerning the online visibility of your hotel, can be a life saver. Alejandro picked up the conversation by introducing some provocative pricing philosophy to the discussion. He believes that true progress at this point in time can often best be made by leaving any previous industry prejudices at the door and starting fresh. It’s time we all stop worrying about the past and start using our own amazing powers of innovation to get to work! This means thinking holistically because pricing is only a tiny piece of your brand offering and most of the time and, according to Alejandro, not even the most important one. Also, realize that you haven´t really lost the fight for bookings with the OTAs, but you do need to act fast now to make sure you don’t. This means you need to stop losing money—now. How? Alejandro feels there are some common pitfalls to watch out for. For one thing, there are often price gaps you may not be aware of, and these can end up being big price detractors. Also, there are environmental/location blind spots which can lead hotels to suffer what he calls market myopia, like having dead comp sets and very limited, non-data driven distribution. Add to this the fact that nobody really owns today’s customer. They are simply too savvy and have far too many booking choices to think of them this way anymore. How can you avoid these issues? Alejandro suggests you do everything you can to help transform your brand into a lively entity that engages guests, holds their attention, and increases bookings by showing them they are not merely a transaction. For instance, when you make price decisions, always try to be honest. Also, remember to create a welcoming and inclusive culture with your staff where you foster free thinking and idea sharing. Price value tactics can come from the most unlikely places. While some of what we discussed requires more planning and strategy before execution, there are plenty of things you can do right now to improve your hotel’s pricing strategy and outcomes. Target the traveler personally and relevantly. Remember, you do not own them. Drive traffic from a range of digital sources and track effectiveness, continually improving. Provide a seamless booking experience via your CRS/IBE using persuasive messaging. Don't be afraid to throw out old ideas that no longer work for today's modern hotel. Remember to reach out and put your tech partners to work for you and your guests! If you can do these consistently, you will be going a long way toward increasing your revenues while delighting and retaining more guests, and strengthening your unique brand identity in the process. Get these successful strategies straight from the mouth of hoteliers who executed them.